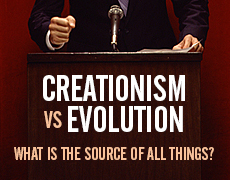 Creationism vs Evolution: What is the Source of All Things? » Creationism vs Evolution: What is the Source of All Things? Home / Creationism / Creationism vs Evolution: What is the Source of All Things? This is without a doubt one of the best articles I have read on the Creation vs Evolution debate. It is a bit long, but it will not be a waste of time. If Christianity does not take Genesis 1 very seriously and literally, it is suicidal. The foundation of its faith has been effectively undermined, and whatever claims the church makes for its faith are undercut and devolved. The source of things is all-important. If the triune God by His sovereign and just acts created all things, then all things are derivative from God’s act, dependent on His Being, and subject to His total government and predestination. If God is the Creator, He is also the determiner and the lawgiver. If the universe was “created” by an accident, out of nothing, then nothing external to it can determine it. Whatever possibility there is of any determination in the cosmos must then come from that cosmos. The title of a book published in the mid-twentieth century and long in print, Man Makes Himself, by V. G. Childe, states the matter clearly. If the origin of things is from within the cosmos, then, possibly, the control of all things can come from something within that cosmos. This faith leads to man playing God, to man attempting to control evolution, to a belief in a world state controlling all things, and to a religious belief in the powers of time and process. Evolution is a belief that violates a variety of scientific concepts. It posits spontaneous generation, the emergence of something out of nothing, miraculous changes such as a non-eye somehow becoming an eye, and so on. For God’s creative act, it substitutes time and process and endows both with Godlike powers. Somehow the mindless churnings of process for billions of years work amazing miracles. Somehow, out of total nothing, a single atom emerged, and that single atom had all the potentialities of a universe; in brief, it had amazing god-like powers! Evolution requires belief in miracles greater than any described in the Bible! It is not only the faith of those who hate God but also of those whose premises are irrational ones. The issue is process versus act, and the difference is a vast one. If the source of being is process, then very important things flow necessarily from that fact. Process originates in an ultimate nothingness, and then a chaos, out of which the cosmos evolved. While Zechariah’s immediate reference here is God’s messianic purpose in and through Israel, it means also that God’s planning or predestination includes and circumscribes all things. A predestinarian faith cannot long-endure without a strict creationism. The issue is process versus act. Our choice is important. If the truth be process, power and grace come from below. Not surprisingly, the culture of evolutionism has led to a revival of occultism and magic. Magic is the belief that power resides in the natural world and is amenable to control by man. Non-Biblical sciences are closely related to magic and represent sophisticated versions thereof. Magic is a search for lawless power. When geneticists talk of genetic engineering, their ideas at times are more related to magic than medicine. If we recognize God as the Creator, then for us the source of all power, grace, law, and morality is from above. Situational ethics is then, for us, evil: it is an attempt to play god. Virtue for us, in the sense of strength and morality, is from God alone, not man. An evolutionary premise and faith will mean that we will seek virtue from below. Quite logically, Emile Durkheim, in The Rules of Sociological Method, saw the criminal as an evolutionary pioneer. Durkheim, in terms of his faith, saw, first, the criminal as a potent force because he came from below, from the underworld of man, and second, he saw the criminal as the vanguard of man’s evolutionary future because the criminal challenges the existing order. The evolutionist will logically see virtue and power as emanating from below. In practical terms, he will favor those who are socially “from below.” He will see virtue in criminals, in street people, in ghetto blacks (but not in Japanese, because they excel), and he will work for criminal “rights,” feminism, and so on and on. The result is the religion of revolution. Revolutions, usually the work of anti-Christian intellectuals, are done in the name of the people, by which is meant those socially at the bottom level. These supposedly incarnate virtue, which must come from below. Revolutions have been either pagan, as the fifth century A.D. Mazdakite revolution in Persia, which made all property, money, and women into common property, or they are anti-Christian. Virtue for revolutionists resides at the bottom, in chaos, and it institutes chaos to destroy the old order and the men and women belonging to it. Mass murders become a virtue. The word purge before the French Revolution meant an enema to eliminate feces; it has since gained as its primary meaning the elimination of leading citizens, capitalists, and Christians. Revolutions and purges are inescapable in non-Christian orders: their faith requires it. Such mindless mass murders cannot be eliminated unless creationism replaces evolution. We cannot understand the twentieth century unless we recognize the determining influence of Charles Darwin on men like Marx, Freud, Nietzsche, Stalin, Trotsky, Hitler, Mao Tse-tung, Dewey, F.D. Roosevelt, Mussolini, Churchill, and others. I have twice had criminals argue with me on the invalidity of any judgment of them because of the “truth” of evolution. The revitalization of society for evolutionists is from below, out of revolution, chaos, and anarchy. The upheavals of the twentieth century are the logical products of Rousseau, Hegel, and Darwin, who idealized and enthroned power from below. We are undergoing what Cornelius Van Til called integration downward into the void. The vision of God has been replaced in the twentieth century by the vision of chaos, of integration downward. The definition of man is the definition of man’s life. It is dangerous to overlook this fact. Men no longer see themselves as God’s creation, made in His image. They see humanity in Darwinian terms. Over the years, I have heard a variety of such definitions, from man defined as a perpetually rutting animal, to man as an example of evolutionary error. To define man in Darwinian terms as a “higher ape” is to strip man of his high seriousness. To declare man to be a creature made in God’s image, but fallen, is both to stress his high potential as well as his present depravity outside of Christ. Even as Adam defines the old humanity of fallen man, so Jesus Christ, in His perfect and sinless humanity, defines the goal for redeemed man. Genesis 1 makes clear that the creation of man was God’s sovereign act. According to Ephesians 2:8, “For by grace are ye saved through faith; and that not of yourselves: it is the gift of God.” In our time, people are so schooled in terms of evolutionary process that they can only view the future in like terms. Growth and processare related terms, and they are sometimes used interchangeably, but they are not the same. Growth implies life and development, whereas process implies mechanical or mindless changes which can include death and decay. Process thinking tends to exclude God’s power and grace and man’s purposeful activity. Process thinking views the future in Darwinian terms, as slow change, not as God’s work in history. It views possible changes in history in biological or mechanical terms. Examples of this are the beliefs that, like organisms, cultures rise and decay, or that some mechanical pendulum will bring about social reversals. Process thinking is the antithesis of Biblical faith and thought. Not only has Darwinian process thinking infected sociology and psychology, but we now have process theologies. Once creationism is dropped, process replaces grace in theology and life. A humanistic pastoral psychology replaces Biblical counselling. Creation must be viewed as the act of the personal and triune God, not as a process of nature. Although process and revolution seem to be contradictory concepts, they are related. Both presuppose power from below: their premises are identical; the outworking thereof is different. The Biblical doctrine of origins declares that the creative act and power come from above, from God. We must therefore look to God for all that follows. God saw His creation as “very good” (Gen. 1:31), and the disorder that followed came about because man sought to shift the motivation and power to himself (Gen. 3:1-5). The essential premises of sound thinking are in Genesis 1. To neglect this chapter as foundational to life and theology is to create a false religion. Before man and the universe, there is God. To understand man and the universe, we must look to God and His infallible word. Taken from Genesis (Commentaries on the Pentateuch),Volume 1, p. 3.